The main fundamental difference between sputtering and evaporation is the mechanism through which the source material is energised to produce a vapour. The simplest form of sputtering is DC planar diode sputtering where a simple plasma is used to produce the ions to cause sputtering. 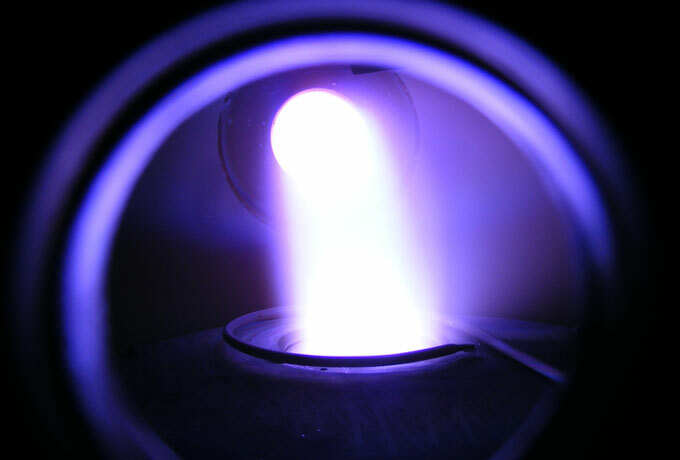 For this a noble gas, typically Ar, is introduced into an evacuated chamber (delivering a process pressure of ~ 10-2 to 1 mbar), the source material (known in sputtering as a target) is the cathode and the substrate is the anode. An electric gas discharge is generated by applying a potential between these two electrodes. The plasma ions bombard the negatively biased target ( ~ -1000 V) and transfer kinetic energy to the surface causing a momentum cascade and release of target material as vapour. The positive ions in the plasma are attracted by the electric field to the negatively charged cathode. Depending on the energy, mass, angle of incidence of the impacting ion and the binding energy of the target atoms the incident ion can bounce back, adsorb on the surface, implant or eject atoms from the target surface. The ejection of atoms from the target surface is known as sputtering. The target atoms are either ejected through a direct collision from an Ar ion, although this is highly unlikely and would typically only occur for target materials where the atomic mass is less than that of argon, or through a collision cascade. Here the incident Ar ion can transfer momentum to the target surface atoms by a collision cascade to release a surface target atom. The majority of the sputtered material is composed of neutral target atoms, however in some cases they can be ions. Besides the ejection of target material a number of other processes might occur, as depicted in figure 1. Figure 1. Illustration of ejected species from a target following the impact of ion. The incident ions with low energy can be reflected, or if the incident ion has very high energy (> 2 keV) the ion can implant into the target. The incident ion can also excite target atoms to emit secondary electrons; these are subsequently accelerated away from the target, ionising neutral gas atoms which assist in maintaining the plasma. Secondary ions are also emitted however it is unlikely the positive ions will escape from the target but, if present, negative ions (e.g. negatively charged oxygen ions sputtered from a metal oxide target) are accelerated away. Excited sputtered ions can emit photons with wavelengths (both ultraviolet and visible) characteristic to the target material. X-rays can also be emitted which can sometimes cause damage to delicate substrates.